What is Peer to Peer (P2P) Fundraising? Peer to Peer Fundraising (P2P) is the process of fundraising using social networks to solicit contributions from many clusters of connected people to raise money for a cause. Traditionally, fundraising has involved face to face solicitations by a paid professional or volunteer for the organization trying to raise funds. Today, P2P fundraising, also known as social fundraising, has taken a new direction by utilizing an array of online tools, readily available, to expand the reach of non-profits in multiple paths simultaneously. Social networking takes fundraising solicitation off of one individual and puts it into the hands of the non-profit's community and supporters. The process of soliciting donations, with online social fundraising tools, enables a non-profit to leverage their entire community of members and volunteers to publicize a campaign or event, and solicit donations from their friends, family and colleagues. Rapid promotion of campaign(s) and/or event(s). Quick adjustments to campaigns for unparalleled flexibility. Efficient collection of donor data for management and status reporting. Convenient platform for a donor to make a donation online at any time. 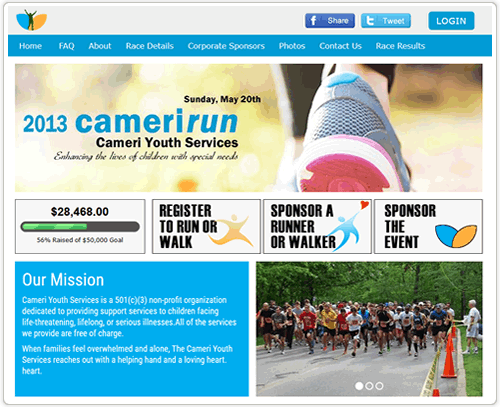 Create a multi-page event website that uses your nonprofit organization's logo and colors. Have links to your event's details, contact information, and frequently asked questions. Create excitement with the use of real time performance widgets on your website such as event clock countdowns, event thermometers, leader boards and most recent sponsor boards. Encourage competition between participants and teams with automatic weekly email updates which include these widgets. Create custom ticket prices, goal levels and survey questions per participant. Allow team registration. 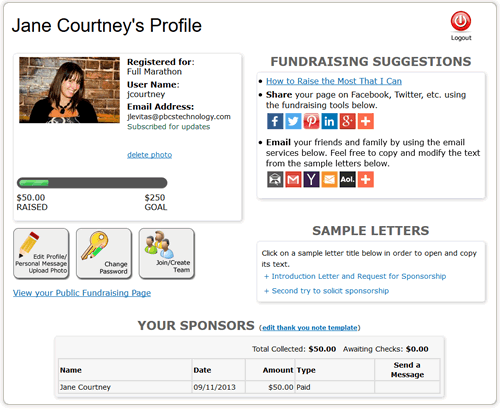 Automatically creates a personal fundraising page per participant and per team. Allow registration fees to be applied towards participant fundraising goals. Option for participants to make a donation towards their goal during the registration process. Place custom text at the top the registration page during registration and after registration as ended. 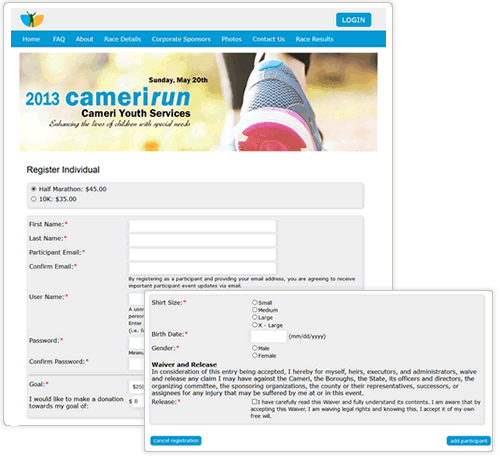 Customize the text on both your registration receipts and participant welcome emails. Generate financial reports based upon registration data. By turning your participants into fundraisers, you can turn a fundraising event that focused on registration fundraising to community fundraising. Each participant and team captain can log into their participant/team fundraising center in order to personalize their fundraising page. They can upload a photo and explain to their potential sponsors why they are supporting your cause. Share the cause using social media tools such as Facebook, Twitter, Pinterest and email. Track progress. Create friendly competition by encouraging participants to create and join teams. Extend your cause's reach beyond your participants. 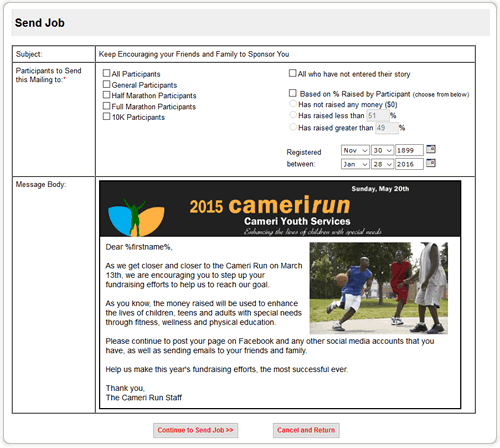 Run reports to allow you to easily keep track of your participants' and sponsors' information. Use filters and sorting to segment data for analysis. Identify participants and teams who need more encouragement. 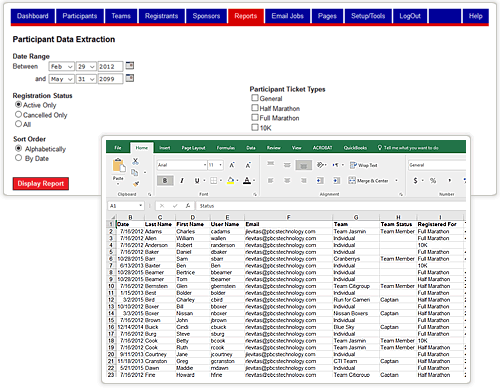 Run statistical reports to provide your organization with participant and sponsor stats quickly. Run reports that allow you to analyze your data as well as share data with third party vendors. Keep in touch with your participants. Provide them fundraising updates, coaching tips and venue updates. Communicate with team captains to keep fundraising momentum going. Set up automatic weekly updates, which include leader boards, to both individual participants and team captains to encourage friendly competition. Option for participants to personally thank their sponsors, from their personal fundraising center, and encourage them to share the cause with their friends and family via email. Send email blasts to thank sponsors and encourage them to spread the word about your cause.